First escape: Davis broke out of the Pettis County Jail in Sedalia, Mo., on the night of Saturday, March 9. Authorities say he climbed into the ceiling, made his way across the rafters and down into a "maintenance access closet," then simply walked out of the jail. His absence wasn't noticed until the following night, reports the Washington Post. Second escape: This one was even more remarkable. 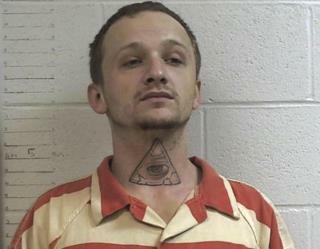 Police arrested him in Oklahoma on Wednesday and placed him in a patrol car, handcuffed. As officers were interviewing someone else, Davis drove away in the police car. "He somehow got the cuffs to the front of him and somehow managed to get through the window in the partition," Heavener Police Chief Ty Armstrong tells the Sedalia Democrat. "He went through the window, stole the car, and went approximately 2 miles and crashed, then fled on foot." Davis remains at large, and police say it's possible he hopped on a train. Check the records. I bet the sheriff charged the county for feeding him when he wasn't even in jail. Oh! A standoff with him doesn't get him shot. But, an innocent man walking to work, is now dead simply because he may have looked like him. I agree with the family and cry BS with that; he had a knife story. They were a little too focused on that, "suspect may be armed and dangerous." You need to first make sure it is the suspect. As for the woman who was driving the real suspect around... she didn't appreciate freedom much, did she? You know you've been keeping in contact with him, go gambling, and then YOU call the police. All she managed to do was call them on herself. I do believe he forced her to do some things, and somewhere along the way something went wrong. However, I wouldn't have called the police knowing my history with him. Now, if she would have called before all the appearances of having fun... That's a different story. Otherwise, I would have simply vanished while he was sleeping. He would have had to try to find me. I wonder if he is still handcuffed?